Explore the World of Snacks!Snacks provide nutrients that a breakfast, lunch or dinner may not include. Well-chosen snacks can refuel the body between those main meals. Enjoy a couple of daily snacks in smart-sized portions. MyPlate is the icon that shows how to eat healthfully. 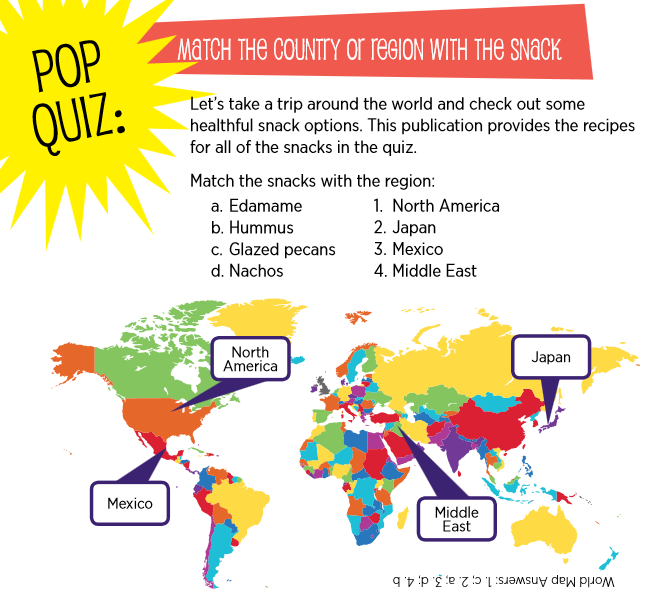 Here are some of the key messages from MyPlate and more snack ideas from around the world. 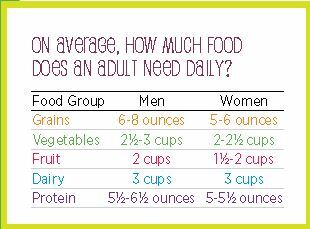 Check out www.choosemyplate.gov for more information about healthful eating. Did you know? Oatmeal is a whole-grain and heart-healthy food. Try a snack idea from India: Cucumbers with a dash of salt and chili powder. Try some apple slices with peanut butter to quench your hunger with a fruit and protein. Did you know? Peanut butter first was made by the ancient Inca civilization. How about a “cheese hedgehog”? What’s that? Read on to learn more! Did you know? Cheese hedgehogs are German snacks consisting of cheese squares and grapes on toothpicks arranged on a melon or pineapple slice. This creative snack resembles a hedgehog. Enjoy roasted or slightly salted peanuts, which are common Russian snacks. What if I have leftover ingredients when I make these recipes? Don’t waste them! You can use the ingredients in other ways. Visit the recipe database at www.ag.ndsu.edu/food or www.allrecipes.com to find recipes. Place the chickpeas, tahini, lemon juice, garlic, salt and ground cumin into a food processor or blender and process until very smooth. Add water if needed to achieve a soft, spreadable consistency. Adjust seasoning with lemon juice and salt to taste. 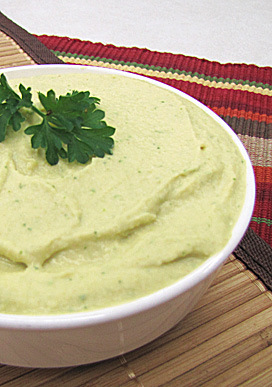 Mound the hummus in a serving bowl, sprinkle with parsley and refrigerate until serving time. With added salt, each serving has 210 calories, 16 g fat, 5 g protein, 13 g carbohydrate, 3 g fiber and 360 mg sodium. Without added salt, each serving has 210 calories, 16 g fat, 5 g protein, 13 g carbohydrate, 3 g fiber and 160 mg sodium. Sprinkle with paprika, cumin and/or parsley for added color. Serve with pita bread, crackers or whole-grain chips. Fill a medium-sized pot three-quarters full with fresh, cold water and put it on the stove on high heat. When the water comes to a boil, reduce the heat to medium high, add the edamame pods and cook for five minutes. Remove from heat. In a colander in the sink, drain the edamame, then run cold water over the cooked edamame to cool it. Place the cooled, drained edamame in a dish and sprinkle lightly with salt. Microwave method: In a microwave-safe, covered glass dish, microwave frozen pods for two minutes. Wait one minute, then test for doneness. Microwave for another minute if not done to your liking. Makes three servings. Without added salt, each serving has 180 calories, 10 g fat, 18 g protein and 6 g carbohydrate. 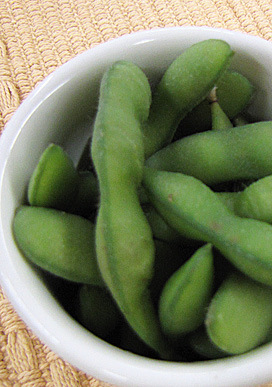 Edamame pods usually are not eaten; you eat just the beans inside. To eat them, gently press the pods between your thumb and index finger to push the beans out of the pod one at a time. Or put your teeth over the pod, gently clamp down over one bean at a time and slide it into your mouth. If you want to use edamame in a salad, cook it first and then shell each pod by hand because the pods are difficult to shell before they are cooked. Store cooked edamame in a refrigerator for up to four days. *Remove seeds to decrease hotness. Rinse the fresh vegetables under running water and prepare as directed. Mix fresh ingredients together to make salsa; alter the recipe to suit your taste preferences. Mix the refried beans with the salsa and cook for about 20 minutes in a saucepan on the stove over medium-low heat. Add cheese and stir until melted and then pour it into a serving dish. 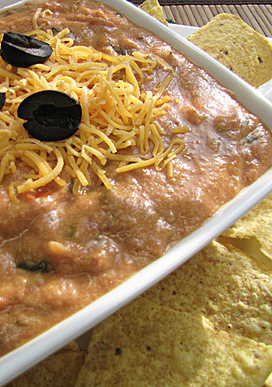 Serve with baked tortilla chips, whole-grain crackers and/or celery or carrot sticks. Refrigerate leftovers and use within four days. Makes 12 servings. Each serving has 60 calories, 0.5 g fat, 4 g protein, 8 g carbohydrate, 2 g fiber and 230 mg sodium. Wear disposable rubber gloves when finely chopping the jalapeno pepper because it’s a natural irritant to the skin. Make sure to wash your hands with soap and warm water after handling the pepper and before touching your face or eyes to avoid possible irritation as well. Use canned salsa instead of making fresh salsa to save time. Serve with tortilla chips. To keep calorie and fat content low, serve with baked tortilla chips. 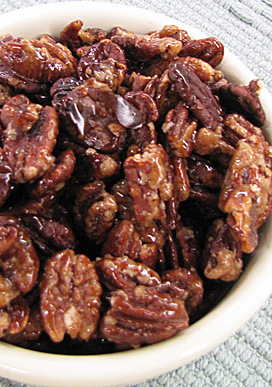 Instead of a candy bar or other sweet treat, try a couple of tablespoons of glazed pecans for a pick-me-up. Put pecans, sugar and salt into a large nonstick skillet. Stir the mixture constantly over medium heat. Cook sugar-nut mixture until sugar melts and turns a rich, golden color. Transfer nut mixture to one or more plates so you have one layer per plate, and let cool slightly. Makes eight servings. Each serving has 120 calories, 10 g fat, 1 g protein, 8 g carbohydrate, 1 g fiber and 35 mg sodium. Making a large batch? Use more than one large nonstick skillet to better evenly coat all of the pecans with sugar glaze. The sugar can burn easily, so watch it carefully. Use a different kind of nut or a mixture of nuts.